Historians often define political periods in the United States according to the dominant president of the era. Arthur M. Schlesinger, Jr., most famously wrote of an Age of Jackson, and other scholars have proposed Ages of Jefferson, Lincoln, and Franklin D. Roosevelt. Sean Wilentz adds another chapter to this genre, labeling the last quarter of the twentieth century after Ronald Reagan, with his book The Age of Reagan: A History, 1974-2008. From the 1974 Watergate scandal until 2008 when Barack Obama was elected to the presidency, the U.S. witnessed the triumph of political conservatism. Ronald Reagan harnessed conservative angst to win the White House, pursued conservative polices as president both domestically and internationally, and left a legacy his conservative political successors attempted to continue, with mixed results. The Age of Reagan provides a valuable overview of recent U.S. political history. During the 1970s both major political parties experienced internal divisions. Conservative Republicans criticized Nixon, Gerald Ford, and Henry Kissinger’s pursuit of détente with the Soviet Union as dangerously weak foreign policy. Liberal Democrats railed against Jimmy Carter’s ineffective leadership in solving the nation’s economic and social problems. Americans turned away from moderates in both parties and looked to conservatism when they elected Ronald Reagan president in 1980. Reagan succeeded in entrenching conservatism within the federal government, particularly with his judicial appointees and expansion of presidential power. Yet the author correctly debunks much of the mythology surrounding Reagan, noting that his administration often pursued pragmatic policies, unable or unwilling to roll back much of the liberal reform of past years, and also encountered many setbacks, most notably with the Iran-Contra scandal. The Age of Reagan goes on to describe the triumphs and travails of Reagan’s presidential successors. George H. W. Bush, less conservative than his predecessor, encountered difficulties in appealing to both the moderate and right-wing factions of his party. Bill Clinton, a self-described New Democrat, governed as a centrist following Republican capture of Congress in the 1994 elections, recognizing this as a requirement in a conservative age. Wilentz concludes with a brief overview of George W. Bush’s tumultuous presidency. During these years conservatism may already have been running on borrowed time, butevents of the Bush years, such as the controversial election of 2000, the disastrous Iraq War, the miserable response to Hurricane Katrina, and the dramatic collapse of the economy ultimately sounded the death knell for the Age of Reagan, as Americans rejected conservatism in favor of Barack Obama’s call for political change. 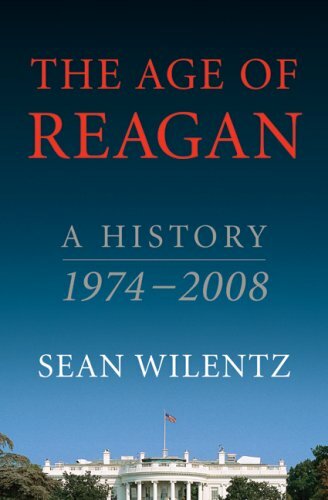 Sean Wilentz’s The Age of Reagan is a fascinating narrative of recent U.S. history, and will prove engaging reading, especially in the aftermath of the 2010 elections. Time will tell if the Age of Reagan truly is over. The emergence of right-wing groups such as the Tea Party and the continued popularity of demagogic figures like Rush Limbaugh and Glenn Beck suggest that the conservative movement will not exit quietly into the night. The current president and his supporters would have to convince Americans of the superiority of their policies, no small task. Their success or failure will determine whether the United States has entered a new period, perhaps an Age of Obama, or returns to the Age of Reagan.